Push messaging was brought into the mainstream by Research In Motion, which got started selling two way pagers. RIM gradually advanced its network with a bolt-on system that interfaces with corporate messaging servers (such as Exchange Server or IBM's Lotus Notes Domino server), grabs any updates from the server, and sends them to RIM's own servers at its Network Operations Center, which then relays the messages over the mobile network to BlackBerry devices. This works out well for RIM, as it gets to sell the BlackBerry devices, the BlackBerry Enterprise Servers that connect to each company's mail server, rather expensive client access licenses (CALs) for each user served by the BES, and then on top of that charge steep monthly messaging fees for every user served by its relay system. In response to RIM's success, Microsoft advanced its own competing push messaging component to Exchange Server (somewhat confusingly called Exchange ActiveSync or EAS, although it bears little in common with the desktop ActiveSync tool), which pushes out updates to mobile devices directly. Microsoft is currently still in a distant runner up position behind BES, so it does not yet charge for CALs for using EAS, and does not bill companies per-user service fees to relay messages to their own employees. Of course, Microsoft does still require per-mailbox CALs for every user on Exchange, which results in making it an expensive solution once you start adding users. Apple touted Microsoft's EAS direct messaging architecture as a security and reliability feature when it announced that it had licensed Exchange ActiveSync for use on the iPhone. When using EAS to send Exchange messages to the iPhone, companies push messages directly to their employees rather than paying RIM to forward these through its BES and NOC (below, as illustrated by Phil Schiller in the iPhone 2.0 announcement). RIM's BES has exposed users to a variety of serious critical security vulnerabilities, while RIM's NOC has experienced high profile blackouts this spring that left millions of subscribers unable to receive new messages for hours. 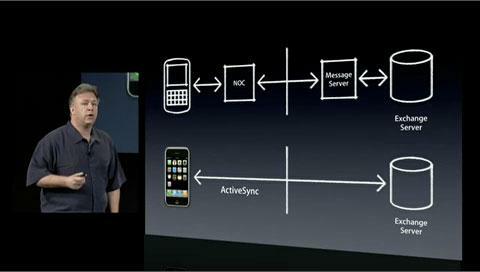 For MobileMe, Apple hosts the messaging servers itself and similarly pushes updates directly to any configured mobiles. However, it also pushes messages to subscribers' desktop email, as well as to Address Book and iCal on the Mac OS X desktop. This is still quite a unique feature for any service provider to offer, particularly to consumers. Microsoft's Hotmail, Google Gmail, and Yahoo Mail all offer push email-only services for mobile users, but nobody currently offers low cost push email, contacts, calendar, and bookmark support as MobileMe does, let alone matching the integrated iDisk file share, web hosting, photo and video gallery, and PC sync features that are also bundled into MobileMe. Just to match the push messaging features in MobileMe, you'd have to pay steep fees for a hosted Exchange Server account. The cost for a 10GB, hosted Exchange plan is $24.95 per month, per mailbox from Microsoft-certified partner DNAMail, plus a $2 monthly fee for Windows Mobile or BlackBerry mobile push service, or $324 annually (the BlackBerry plan does not get mobile push calendar and contacts and incurs an additional $20 fee, for a grand annual total of $344). Despite being more than three times the retail price of MobileMe, DNAMail only offers half the storage; Apple gives MobileMe subscribers 20GB to allocate between email and iDisk use. DNAMail offers cheaper plans with even less storage, while Apple offers a $49 upgrade to 40GB, and a $99 upgrade to 60GB or storage. So Apple's most expensive option is just shy of $200 at full retail, but provides six times the storage of DNAMail. Apple also offers a $149 family plan, which supplies 20GB of storage for a primary account, plus four family member accounts, each with its own email address and 5GB of storage. In some cases, hosted Exchange Server accounts are only available to businesses buying multiple accounts for their employees. Many of the features of a hosted Exchange account are also only useful in a shared office setting. Microsoft itself does not currently offer individuals any type of hosted Exchange account, nor has it yet released its Live Mesh service, which would sync files and settings between computers as MobileMe also does (and as .Mac has been doing for years now). Further, Exchange is really designed to be used over a high speed local network, not over the Internet. 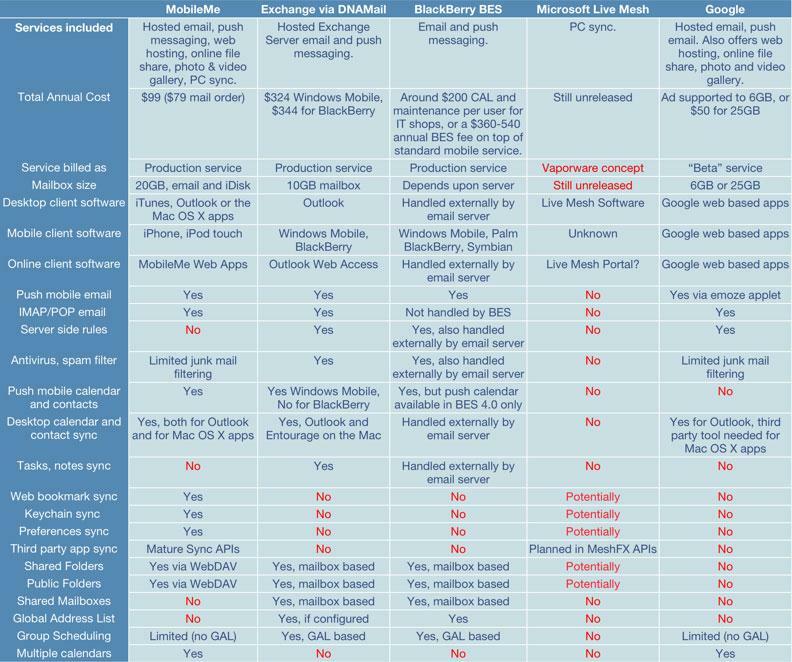 On page 2 of 2: MobileMe's industry standard protocols vs. Exchange proprietary RPC; Google and Yahoo's web services and RIM's mobile push; Other features missing in MobileMe vs BlackBerry and Exchange.